We have previously discussed the intrinsic and extrinsic factors responsible for most running injuries. A quick refresher may be found here. The human body is an amazing creation, and the more clinical experience I gain as a Physiotherapist the more amazed I am about it’s inner workings. You may be surprised to know that the most common cause of 95% of running injuries is musculoskeletal dysfunction, and there is a growing body of neuroscience evidence that supports this. Musculoskeletal dysfunction is an intrinsic factor that we discussed briefly in part 2 of running injury prevention. You may recall that intrinsic factors are those factors that are more specific to the individual runner, and are within the runners’ control. I would like to expand on this topic now as I feel it is very important for runners to understand this concept to enjoy injury free running. A “dysfunction” by its’ definition is anything that is not working properly or optimally. A musculoskeletal dysfunction involves any muscle, joint or nerve that is not functioning optimally, or a pattern of movement that is not ideal. Let’s talk about these in a bit more detail. A muscle dysfunction is basically a muscle that is “unhappy”. This is characterised by tension, ropey, tight or thickened muscles… muscle that have “knots” in them. These tight muscles can be easily palpated, for example over the shoulder, or anywhere else in the body. Muscles in this dysfunctional state do not produce the same amount of power as a healthy muscle,causing surrounding muscles to overwork. They generally do not get good blow flow through the muscle fibres as the tight and thickened bands of muscle impede blood flow through the smaller capillaries. This further deprives the muscle of nutrients and oxygen, causing more tension to develop, creating a “vicious cycle”. Unhappy muscles will generally be weaker and tighter than their normal counterparts. You can see how this can potentially lead to over strain if these muscles are put under load from running, especially running up hills or increasing speed or volume. “Unhappy” joints are joints that are under more load or pressure within the body. They react to this extra load by becoming “stiff”, or resistant to passive movement. They may move within a normal range, for example the knee may extend and bend to what is perceived to be normal limits, but at the end of range there is reduced movement. This extra resistance is easily measured by an experienced practitioner, such as a Physiotherapist. In fact, the amount of passive movement within a joint can be easily tested and measured, and this is an indication of how well the joint is moving. All synovial joints in the body, ie joints that have a capsule, cartilage and joint fluid(eg, knee, hip, ankle, shoulder, elbow, etc) will have a certain amount passive “accessory” movement, which is the natural sliding movement that occurs between their joint surfaces. This movement cannot be felt by us, but needs to occur for normal healthy joint movement to occur. Stiff joints with less accessory movement do not absorb and transmit load optimally, and so can become stiffer over time. This can lead to wear and tear, and possibly arthritis developing over time if the dysfunction is not addressed. The muscles around these joints will generally be tighter as they try to protect the joint, and may be weaker, which may have lead to the joint dysfunction. Running on unhappy joints may cause further strain on the joint leading to injury, and if the joints are in the spine, these joints can cause pain to be felt in other regions of the body, such as down the leg(a concept called “referred pain”). Nerves are complicated structures, so let’s keep this as simple as can be. Nerves carry impulses to and from the brain…they make muscles work(motor nerves) and they carry noxious(distress) signals to the brain(sensory nerves) from virtually every organ and tissue in the body. They are very important structures, and the vast network of nerves are all interconnected to some degree. Nerves are also mobile structures, that move, slide and stretch around joint interfaces in the body as we move and stretch our limbs and trunk. 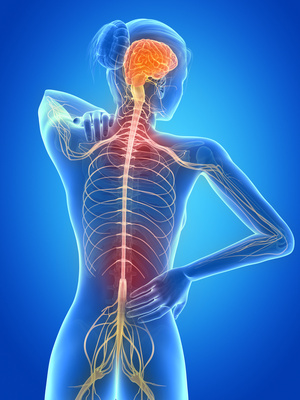 If this nerve movement is restricted in any way, this can lead to pain and further dysfunction, affecting muscle activity and patterns of movement. Again, this loss of nerve movement can be tested and treated by a skilled practitioner, which generally improves muscle function and tension. which can then lead to overstrain of certain areas of the body and hence injury and pain. This is generally, as mentioned, a combination of the other dysfunctions, that is muscle, joint and neural, leading to an alteration of a movement pattern. For example, a weakness of the hip muscles on one side of the body will lead to muscle tension or “guarding” as the weakened muscles try to cope with extra demands. During running, this will cause a loss of control of the pelvis as the runner lands on that leg, creating excessive drop of the pelvis on the other side. This will cause increased pressure on joints of the lumbar spine on the weakened side, as the increased pelvic movement “jams up” the facet joints in the lower back on the same side. This will also increase pressure on the same side hip joint, and all joints affected may suffer loss of accessory movement, or stiffness, that will then affect further muscle activity. A cascade of dysfunctions then develop, one feeding into the next, leading to altered and sub-optimal movement patterns, and perhaps the runner then over compensating by over-striding on the other leg. You can see how this can lead to injury or pain developing for the runner. All of the above dysfunctions are protective responses from the brain, or “protective outputs”. Our brains monitor the state of health of all our body tissues continuously, and this information that is sent to the brain is called “sensory input”. Some of these inputs may be “noxious” that is input about a problem in one of these tissues, for example, a structure(such as a spinal segment) that is under strain. When the brain senses a structure or tissue is under strain, it will create protective outputs, basically to help protect the area from further damage. These outputs are the muscle, joint and neural dysfunctions discussed above. They generally start at a low level, often where the individual won’t feel any discomfort. But if the strain continues to build on the structure in question, so will the protective outputs. These outputs(muscle, joint and neural dysfunctions) also become noxious inputs, which increases the amount of alarm input to the brain. When the amount of this noxious input exceeds a certain threshold, the brain will create a more conscious warning signal to the individual, which is usually some form of pain or discomfort. This is the Accumalutive Strain Model of musculoskeletal dysfunction. One important point to consider here is that the area of the pain signal( another output signal from the brain) is not necessarily the area where the problem is, that is the structure that the brain is trying to protect. Essentially, the brain will choose an output response and location that is best suited for the individual, such that it causes a behavioural change in the individual to address the build up of strain in the faulty structure. Let’s look at an example that may help clarify this. Recently a 37 year old medical specialist consulted me with a 3month history of left buttock and hamstring pain. This she felt as tightness when she ran and soreness afterwards for a few hours. She has increased her volume recently to compete in a half marathon, but had done so carefully and gradually. When we conducted a full body musculoskeletal assessment, we found many dysfunctions in a number of areas, with the left hamstring and hip range being the most restricted. Through clinical reasoning and a systematic process of elimination, we found that her right shoulder(infraspinatous muscle) was the primary contributing factor for her condition, and this cleared all of the related dysfunctions, improved her hamstrings and hip range, and resolved her buttock pain. Why was this muscle so tight? We found that this client did a lot of medical ultrasound scanning, requiring her to reach across her patients and hold her shoulder in awkward positions for periods of time. This had caused a build up of strain in the shoulder, such that it had affected her running action, perhaps preventing adequate upper body rotation, and placing more load on the opposite gluteal muscles to compensate. Had this client mot been a runner,she may have developed shoulder pain at a later stage, but because the strain on the shoulder was enough to affect the higher demands experienced on the body with running, the output signal was sent to the gluteal region as this was likely to affect a behavioural change, ie continuing to run and complete the half marathon was important enough for this individual to address the problem. Poor posture in sitting, standing or lying/sleeping. Performing exercise, lifting weights, running, etc with poor technique/form. Any movement or activity that is irregular or not performed regularly. These dysfunctions are inevitable to a large degree, and we all have them. The key is to be aware of what are the main ones in your body and learn how you can manage them to prevent strain accumulating too much and injuries developing. Make sure you are aware of good posture and how to maintain it in all positions. This will be different for each individual. More info can be found here: http://www.nwpg.com.au/how-to-be-pain-free-at-your-desk. Get your running technique assessed using video apps or software by a qualified health professional to make sure there are no obvious flaws that will place strain on your body and affect your efficiency. You will be surprised at what you may find that could really help with your peformance and reduce injury risk. Ensure strength training is an integral part of your training routine. This will allow your muscles to absorb and distribute more load before they become dysfunctional and affect other structures. You can learn how to do that most effectively here. Make sure you warm up and cool down properly after exercise and running. Stretching is an important part of any routine and will help prevent build up of strain(click link at tip 3 for more info). Enjoy your running and have a very happy festive season!